Pork Liver is the cheapest liver to buy. 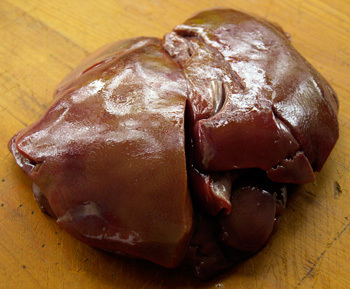 It is the strongest tasting, most coarse and least tender liver, compared to lamb, calf or beef liver. Pork Liver can be bought frozen or fresh. Use fresh within a day of purchasing, or freeze it. But, freezing seems to make it taste stronger yet. Some say frozen pork liver isn’t worth buying; that the taste will be far too strong once thawed. In fact, many recipes specify “fresh, not frozen.” Use thawed pork liver within a day of thawing it. Pork Liver is used a good deal in pâtés, and in pet food. Trim off any remaining connective membranes, fat and veins. Slice thinly, dredge in flour, and sear on both sides in a frying pan until the safe cooking temperature for pork of 160 F / 71 C has been reached. Some say there may be a growing health risk of contracting the E type hepatitis virus from undercooked pork liver, which can be fatal. Instances of this were identified in Japan in September 2004, at a restaurant where customers got to grill their own meats. Six people who preferred their Pork Liver rare contracted the virus; 1 died.